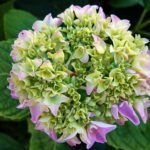 How does one propagate hydrangeas from their leaves? I read somewhere that one can root from hydrangea leaves. You can propagate hydrangeas from cuttings, which is what I think you are referring too. Here is a link that will explain the process.